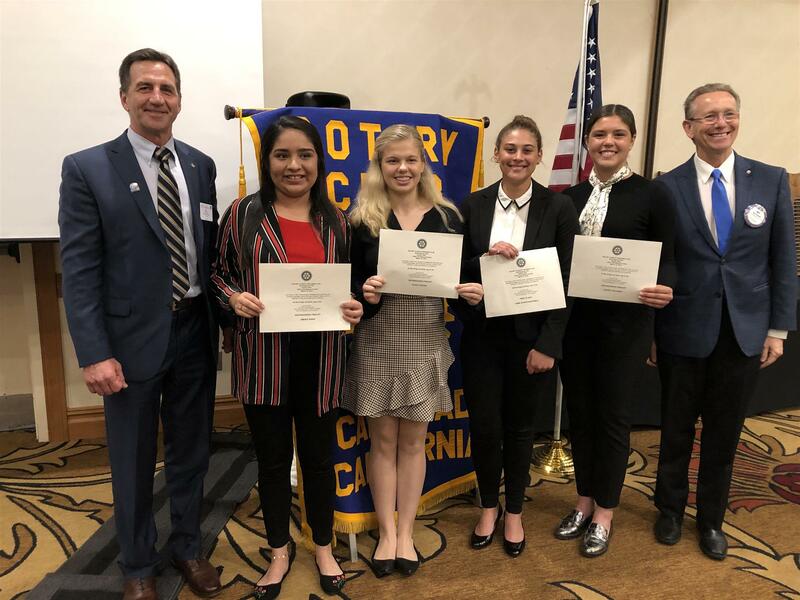 Ray Pearson emceed the Sub Regionals of the Rotary 4-Way Test Speech Contest, featuring four high school students from throughout San Diego County. Each finished first or second in their last competition, qualifying for this event. Contestants spoke for 7 minutes, then shared a little background with us. The evening’s champion, La Costa Canyon Junior Amhi Johnston-Powell, spoke about the social issues and labels associated with being mixed-race, and how dehumanizing it is when society decides a singular “label” — white or black. She noted that the Jim Crow laws abolishing mixed-race marriages were only overturned beginning 50 years ago, and that the multiracial population in the U.S. has grown by 50 percent since 2000, to 4.2 million. She advocated for languaging and an outlook that honors the full person and his/her full background. Second-place Olivia Troyer, a senior at Coronado High School, spoke about how cultural presentations, and presentations that celebrate diversity, are often pricing out middle- and lower-income people. She referred specifically to the $300-400 ticket prices for Hamilton. “Because of putting a high price on culture, we’re cutting out more diverse audiences,” she said, “which is ironic for a show like Hamilton.” The musical theater student, who is on her way to Vanderbilt University, advocated for more reasonable pricing to advance cultural diversity. Escondido High junior Jimena Soria gave a lively, entertaining and fun speech about flying to Mexico last year with 18 family members to say goodbye to her grandmother — and learning how much more interaction, storytelling and family bonding can happen without being glued to our cell phones. Within her body language and joy, we could see how transforming the trip was for her — and how it gave her (and us) a window into the social perils of being overly tethered to our devices. Jimena is currently the student team leader of a program helping incoming freshmen transition to high school. Fallbrook High junior Audrey Gilchrist dug right into our over usage of technology, with an impressive mix of storytelling and research findings that, well, make one take pause — and put the devices away. With 95 percent of teens using cell phones, and 45 percent on screens on a near-constant basis (up to 9-10 hours daily), the problem is deeply impacting academic achievement, social interaction, behavior, and creativity. “The mere presence of a cell phone has the ability to detract from relationships,” she said. “The ability to hold meaningful conversations is compromised.” Audrey is a Junior ROTC member, and varsity field hockey and lacrosse player.